Aug. 6, 2010, 6:20 p.m.
By Laura McGann @lkmcgann Aug. 6, 2010, 6:20 p.m. I don’t know if it’s eavesdropping since I was invited, but this afternoon I listened in by phone on a preview of the much anticipated new local news project in Washington, D.C., TBD. They’re set to launch sometime next week (it’s live as of Monday) that will integrate with a local television station, WJLA. In the past few months, parent company Allbritton Communications has hired about 50 people for the project’s editorial and sales teams. They joined another 50 people working on the project but already employed at existing Allbritton properties Politico and News Channel 8. We’ve known the newsroom will pump out content for the web and television, but despite blogging much of its development some of the details of the project have been pretty hazy. Today I got a better sense of what TBD is going to look like and what it’s going to cover — look for lots of news-you-can-use, like weather and traffic, on multiple platforms. Editor Erik Wemple, formerly of the Washington City Paper, explained that a handful of reporters will work geographic beats, starting with densely-populated neighborhoods, while the rest will cover beats like the D.C. mayor’s race, plus sports and breaking news (thunderstorms!). There’ll also be a special emphasis on arts and entertainment. Oh, and there will be lists. Lots of SEO-friendly lists. Everyday. One reporter will crank out about three of ’em a day for a section called, you guessed it, The List. In honor of TBD’s adopted format, I’m going to stop here and give you six reasons why the project is worth watching for those who care about the future of local news. Most local news stations have a website, but in general they’re either just a home to stories aired on TV or a promotional tool for the broadcast. TBD’s newsroom will be platform-neutral, with content heading both online and on-air, side by side. From a business perspective, there’s potential to bring traditional television advertisers online. 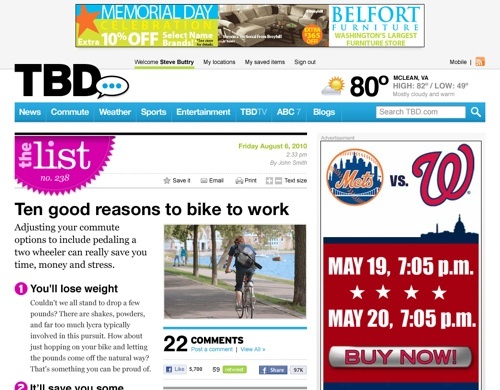 And, in the case of TBD, there’s already a strong sales team in place at News Channel 8 to go after local advertisers. TBD won’t just put its website on your phone. Android and iPhone apps are designed to give users the kind of information they might want from a local news site on-the-go, like weather or traffic reports (noticing lots of weather? ), in a handy format. TBD is obsessed with social media because they want to create an obsessive following online, with readers checking in multiple times a day. Months before launch, TBD was already active on Twitter, as were individual members of the editorial team. This spring I noted that their director of social media, Steve Buttry, would have a seven-person engagement team in place before reporters had even been hired. Comment policies are a topic we’ve written about here plenty of times. Should they be unbridled free-for-all zones or curated? TBD plans to rank comments; users with the best reputations on the site will get to appear higher. The idea is to create an audience excited to participate in the site. They’re also trying a few new tricks, like a pre-written tweet for each article (something snappier and more Twitter-friendly than the headline) and an area that encourages users to help figure out unanswered questions the reporter couldn’t get. Why else? Well, as they like to joke, that’s TBD. POSTED Aug. 6, 2010, 6:20 p.m.
McGann, Laura. "Six reasons to watch local news project TBD’s launch next week." Nieman Journalism Lab. Nieman Foundation for Journalism at Harvard, 6 Aug. 2010. Web. 23 Apr. 2019. McGann, Laura. "Six reasons to watch local news project TBD’s launch next week." Nieman Journalism Lab. Last modified August 6, 2010. Accessed April 23, 2019. https://www.niemanlab.org/2010/08/six-reasons-to-watch-local-news-project-tbds-launch-next-week/.